For the past five years, DePaul Cristo Rey High School (DPCR), a Sisters of Charity sponsored ministry in Cincinnati, Ohio, has been pursuing the idea of a project that would not only engage students, but challenge and inspire them. This year, the Bruin Movement Project was created, and the outcome was remarkable and impactful to the teachers, students, and Greater Cincinnati community. 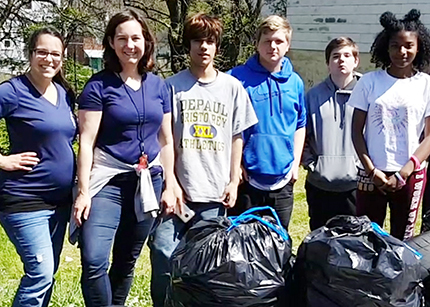 (From left) DePaul Cristo Rey High School media specialist, Nancy Schroeder, Religion teacher and head of the Bruin Movement Project, Jessica Ebert, and four students participate in the Price Hill litter cleanup as part of the students’ Bruin Movement Project. 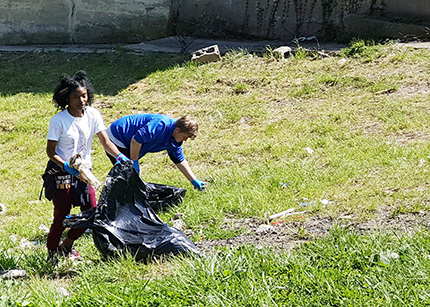 DePaul Cristo Rey High School students participate in the Price Hill litter cleanup as part of their Bruin Movement Project. Two years ago, Ebert teamed up with DePaul Cristo Rey media specialist, Nancy Schroeder, and the sophomore Religion and English teachers to make the project “real.” They came up with a competition for a sophomore service project, one that would fund the most organized and passionate project. Although the students were more excited, some didn’t try because they had no confidence that they would win. In order to be successful, they decided the project would need more time and energy. 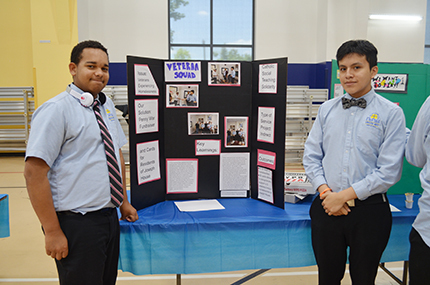 DePaul Cristo Rey High School freshman students give their Bruin Movement Project presentations at the school symposium in May. Throughout the semester, Ebert and DPCR teachers were excited about the possibility that this project could have an outstanding outcome. Her committed partner, Nancy Schroeder, said, “Any time you can provide students with real, meaningful learning experiences, I truly believe they will walk away having internalized the skills they learned.” Annie Reilly, the freshman Reading teacher, also helped spearhead the project, and after years of learning, planning, and refining, 46 projects were ultimately funded. The results of these projects, “Really energized the community,” and “Brought students together,” according to Ebert. But most of all, the Bruin Movement was very beneficial to the students. Ebert said, “So many of them really did see themselves with a sense of wonder—they were surprised, proud, and pleased with what they accomplished.” They also greatly impacted the organizations they worked with and S. Marcel had the feeling that students wanted to continue their service. Both Ebert and S. Marcel were touched by how creative and thoughtful some of the projects were. S. Marcel loved many projects, but was particularly impressed with the project in which a student passed out seedlings of forget me nots, each one representing 10 children killed from violence. She also loved the project group who got a team together to clean up some streets in Price Hill, a Cincinnati neighborhood. Her favorite, however, was the group who made a coloring book of superhero stories where the heroes intervened when people were being pressured to try drugs. They took the books to a library and read them to children. Ebert, on the other hand, loved the project in which a fundraiser was held and 30 care packages of toiletries were created for Shelter House, and the Safe Pastures project, which helped redesign the website for a woman who runs a home for young women who age out of the foster care system. She also enjoyed the creativity of one student who took over science classes for a day and taught her classmates about the benefits of organic produce and the group who built and decorated a Buddy Bench for Dater Montessori (Cincinnati), a bench to promote inclusion and friendships in schools. Overall, 4,340 service hours were completed for the Bruin Movement Project, and the empowerment and dedication put into it will never cease to amaze.